The Parker 25 was released in 1975 and was from the start designed to be a cheap and easy to produce low whilst having a futuristic appearance with a distinctive taper and squared off clip. 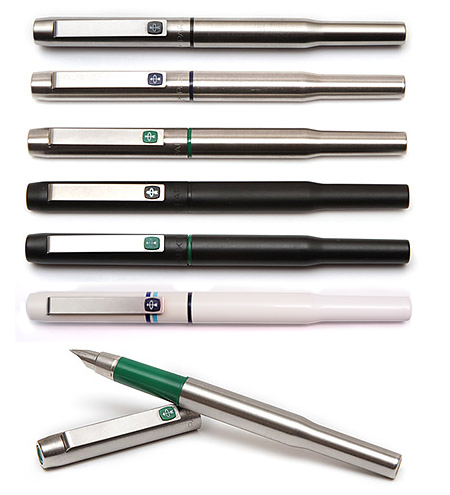 There seems to be a little confusion about when production of these pens actually ceased. However it would appear that the latest known examples bear a 1999 date code. Black Body Pens 1978 - 83. The Parker 25 B which was black epoxy coated metal body, usually with black plastic trims although some other trim colours have been found. White Body Pens 1983 - 87. A white epoxy coating over metal usually with blue plastic trims and often have one or two blue bands on the cap. Rarer versions are without the lines on the cap and rarer still will have no lines and black trims. Other variants reported include coloured steel bodies although these were probably proto-types. Mark II - No Nib Breather Hole. Flat End. "Made In England"
Mark III - No Nib Breather Hole. Dimpled End. "Made In England"
Mark IV - No Nib Breather Hole. Dimpled End. "Made In UK"
It would appear that there is a fair bit of discrepancy trying to date the different marks, but best indications are that the early Mark I pens were produced from 1975 to 78 with the mark II nib being introduced from 1979 onwards. Date coding began in the UK in 1980 making later pens easy to date, but leaving some confusion over pens from the late 1970s. 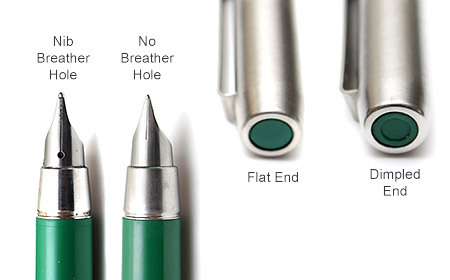 Although not as simple to do as some of the Parker range the 25 nib can be easily removed for cleaning or to replace it. To remove the nib from a Parker 25 soak the pen in warm water with a couple of drops of washing up detergent to loosen any old dried ink then flush the pen clean. 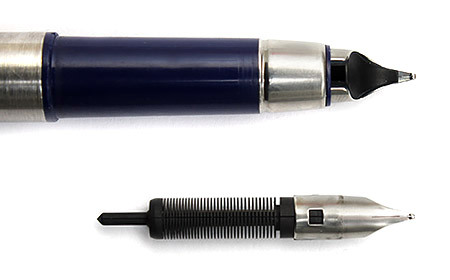 Use a small (Jewelers) flat head screw driver and put the end into the hole at the bottom of the nib then gently pull the nib out sliding away from the body. The nib should just slide out. If you have difficulty try soaking the pen again for longer. To put the nib unit back in simply push it in again.